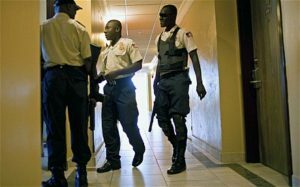 PORT-AU-PRINCE, Haiti – Haitian lawmakers and reporters say police have detained a prominent attorney who has brought corruption cases against the government. Senate President Simon Dieuseul Desras is calling for an emergency session of legislators to discuss the arrest of Andre Michel. Reporters for privately owned Radio Caribe say they witnessed police officers detaining the attorney on Tuesday evening. Several stations say that led to protests, with burning tires in downtown Port-au-Prince. Neither police nor prosecutors responded to phone calls seeking confirmation. The reason for the detention was unclear. His arrest was really an act of stupidity, on the part of Martelly’s team. One must wonder whether or not someone – supposedly in his team – brought about this arrest to revive public sentiment against the Martelly government. There is an old saying…. “Let sleeping dogs lie…” and this really should have been applied to this case.